Sometimes you try hard to create an emulsion, but nothing happens. This might be because the viscosity of your dispersed phase is too high compared to the continuous phase. If you hit such a problem you can do two things. First, increase the viscosity of the continuous phase. Second, use a dispersing method involving elongation rather than shear. Very often we make emulsions where the viscosities of the aqueous and oil phases aren't too different. We generally have more than enough problems than to worry about the niceties of the relative viscosities of the two phases. However, there is a classic diagram that shows how worried we should be if the viscosity ratio (rather than the absolute viscosities) gets out of hand. 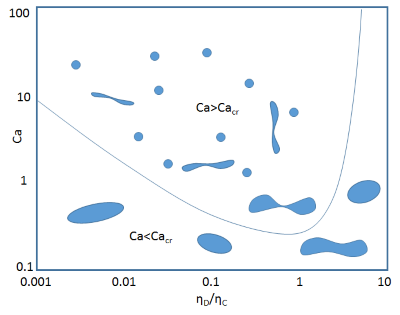 The X-axis is the ratio of the viscosities of the Dispersed phase ηD and the Continuous phase ηC. Notice that important things happen when this is greater than 4. The Y-axis is the Capillary Number, Ca. This is one of those dimensionless constants that appears in many aspects of fluids. It is the ratio of inertial forces, which are Speed * Viscosity to surface tension forces which are just γ, the interfacial energy. When you are trying to make drops by shearing, the relevant formula involves the velocity gradient G multiplied by the radius of the desired drop, R. The relevant viscosity is that of the continuous phase. 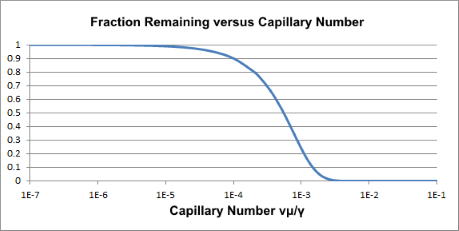 It turns out that below a critical capillary number, Cacr, the energy does not create a drop. Instead it just causes the liquid to spin uselessly - i.e. the shear cannot deform the drop fast enough compared to the drop's ability to spin around within the medium. The value of this number depends on the ratio of the viscosity of the dispersed phase to that of the continuous phase ηD/ηC. So the graph tells us that when that ratio is ~1 it is easiest to create an emulsion via a shearing process (a stirrer) and that above 4 it is impossible. This may come as a surprise to those who have made emulsions above that ratio, but remember this is simply about shear. If there is elongation involved (e.g. using membrane emulsification) then there isn't a problem. What is important in the context of a site that extols the virtues of HLD is that for a given value of ηC and to attain a sufficiently small final R there are two ways to make sure you are above the critical Ca. Adding lots of energy is obvious. Making γ low is straightforward, just have any old surfactant. 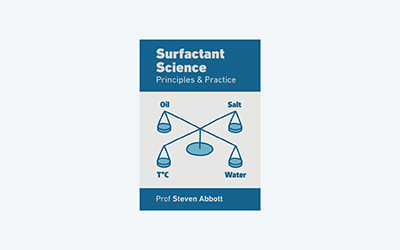 Differences between surfactants might be a few % or even a factor of 2 by, going, say, from 4 mJ/m² to 2mJ/m². This is nice to have but hardly game-changing. Making γ super-low gives factors of 10 or 100! Just look at the IFT app. When HLD=0 those factors of 10 or 100 are readily attained. This means that for a given dispersing energy, R can be decreased by a factor of 10 or 100, something that makes all the difference. It was said that Ca is used throughout fluid science. Another area where it is familiar is the problem of displacing one fluid by another, e.g. to sweep out a fluid from a channel. Using a high viscosity to push out a low viscosity is easy. Doing it the other way is hard - typically the low viscosity fluid just punches a hole through the more viscous fluid and all the flow goes down that one channel. This happens at a Cacr value which, of course, has speed * viscosity on the top and γ on the bottom. EOR, (Extended Oil Recovery), involves pushing oil (which would otherwise just stay there) from under the ground with water. If you are below a critical Ca value then you can expend large amounts of energy and pump large amounts of water and after a few months find some rather dirty water appearing in your well. The decision is the same as with emulsification. Increase viscosity (add some polymer), increase speed (pump harder) or do something smart and make γ super-low? It turns out that when the well is still fairly fresh it makes economic sense to pump harder with a bit of cheap viscosity modifier thrown in. But when that trick fails, the right surfactant has to be added to bring HLD=0 and obtain super-low γ.